When the Second World War-era revue Air Raids & Siren Songs opened at the Springbrook Multiplex on Thursday, it was a strange case of life imitating art. The audience arrived to a stone-cold multiplex to watch a play set during the 1942 London Blitz, when many bombed buildings were also left without power. Apparently the stage technicians weren’t going overboard to recreate the war-time experience — it was just a coincidence. Audience members were advised to keep their coats on — the building’s boiler was on the fritz and a repairman was on the job. If that wasn’t enough vérité, the multiplex’s lights later cut out as the chilled audience was watching the play’s the second act unfold. Actor David Heikkinen, who plays affable soldier Bill, took it in stride. He was about to sing a tune from the film Casablanca. Noticing the electric piano played by music director Ross Dabrusin had gone silent, Heikkinen switched to joking with the audience while waiting for the power to return. 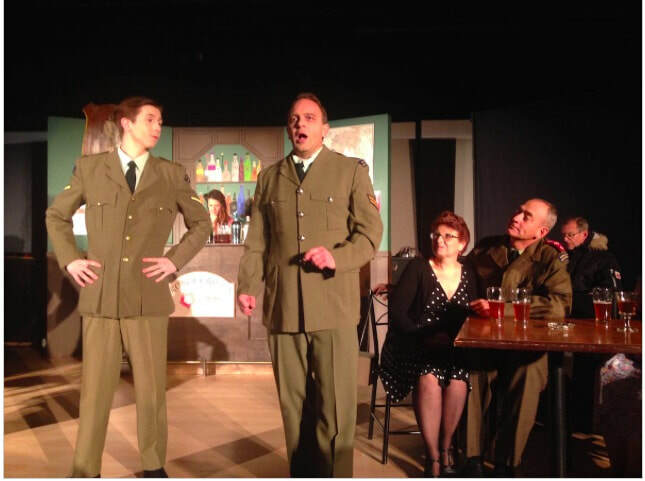 Now that’s showing the same let’s-pull-together-and-make-the-best-of-it spirit that’s exemplified by the generation of soldiers and service women who are depicted in this revue, compiled by Red Deer’s Blaine Newton and directed by Suzanne Hermary. The upbeat Red Deer Players production — which next moves to the Red Deer Legion on Saturday, Nov. 4, and then the Scott Block from Nov. 9-11 — contains more than 33 war-era songs, including Lilli Marlene, My Blue Heaven and Keep The Home Fires Burning. Home-sickness and death only bite at the edges of this story line — Air Raids & Siren Songs is largely lively and sentimental. The premise is that Alfie is keeping a new generation of Canadian soldiers entertained at his pub through songs and jokes. While some singing voices are better than others, the 15-person cast was suitably energetic (some of the vocal standouts include Liz Bennett, Reid Mills, Julia van Dam, Randall Trites and Kirstin Merriman). There were many entertaining numbers, including How Ya Gonna Keep Them Down on the Farm, I Never Cried So Much In All My Life, Mad Dogs and Englishmen. By the second act, the actors were having almost as much fun as some audience members — including an elderly lady who knew every lyric to every old song. Air Raids is a must-see for those who remember the war years, and suggested viewing for anyone who’d like a rosy view of that era.